This emerald shaped Amethyst ring is set in 18K yellow gold, surrounded with a halo of pave Diamonds, is perfect for everyone! The additional design of pave diamonds on the band adds to the unique design! Most Amethyst gemstones come in shades of purple, but you can find a variety of color in the gem from light to dark. The most sought after color tends to be a rich, royal purple. 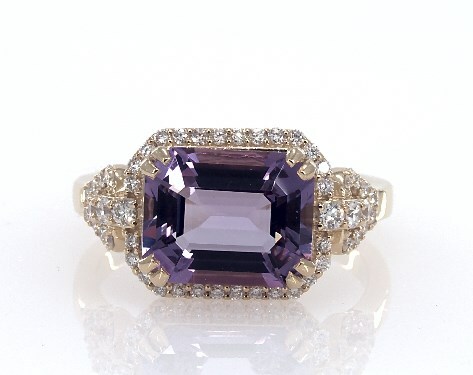 The popular belief of Amethyst is that it promotes clarity of mind.